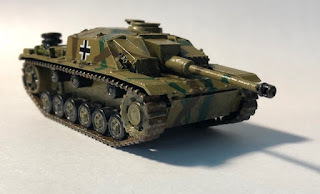 I've started to build up some Germans for the western front which currently includes a Tiger 1 tank. Today I add a second piece of armor, a Stug III which is an assault gun that I learned from Wikipedia was the second most produced armored vehicle by the Germans in WW2. When I built my Tiger 1 that I purchased from Warlord Games I was happy with the price and how it went together and came out at the end that I went to them again and I can say that I was happy with this new purchase too. 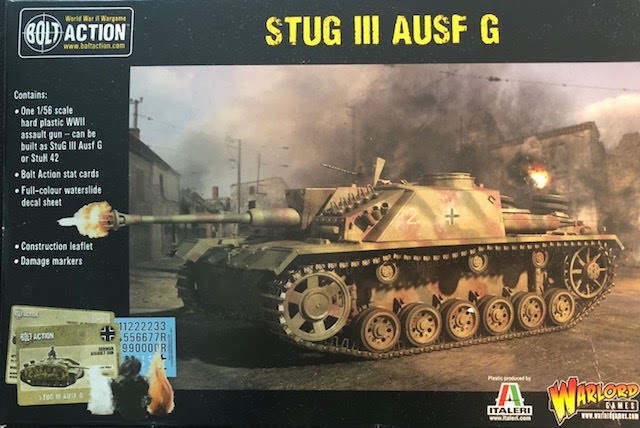 Besides the Stug itself, the box contained a commander sticking out the hatch. I usually don't like to have crew members hanging out of the top during a battle. If I buy a second one I would probably add a guy just to change them up a bit. The tank also comes with the Schurzen armor skirts which I didn't use but probably would on the next one too. This kit also came with three damage markers and stat cards for use in Warlord Games WW2 game Bolt Action. 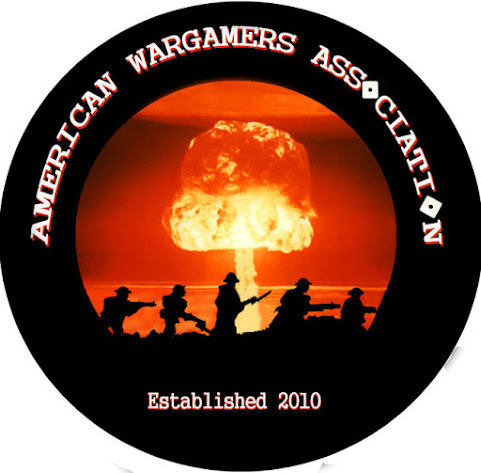 I like the cards but at this time I have no plans of switching from 2 Hour Wargames' Nuts! WW2 game to Warlord Games Bolt Action game. When I sat down to paint this tank I could not for the life of me remember what main color I had painted the Tiger 1 with. I tried numerous colors that I had but none of them matched. I eventually found the closest color I could find so from this point on my German tanks main color will be Vallejo's Middlestone which I've seen online as the best color to start from. 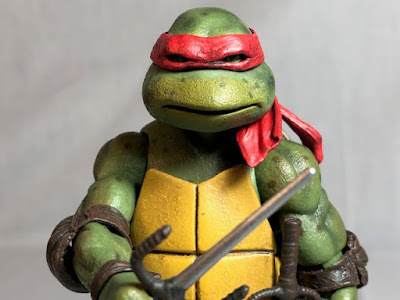 Close, but not the right color. 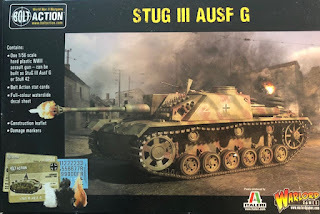 I like the way the Stug III came out and am looking forward to using it in a battle against some allied soldiers and even a tank or two. 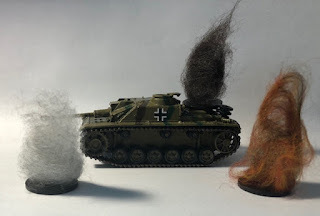 In order for my German tanks to fight some Allied tanks, I'll first need to buy some and then put them together. 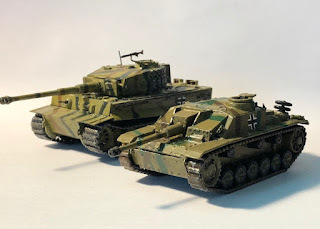 Despite the fact that I've been playing WW2 in 28mm scale these are the first two tanks I've bought. 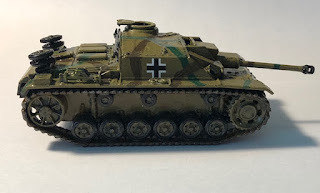 I have another Warlord Games vehicle that I've almost finished but my next big tank purchase will be a Sherman. 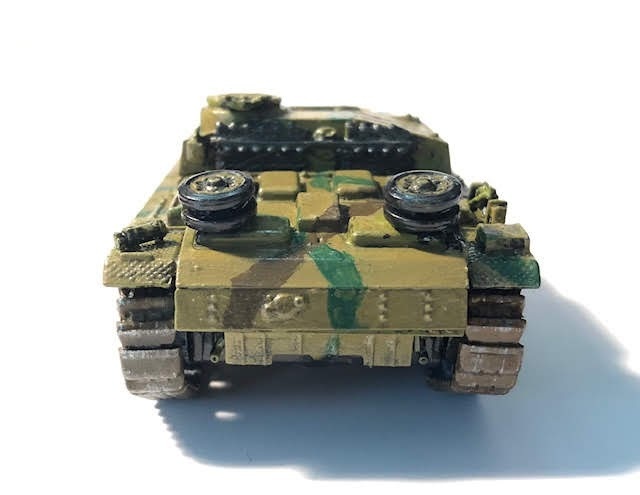 If you are looking to purchase some WW2 28mm armor I can recommend Warlord games vehicles, and for that matter troops too. 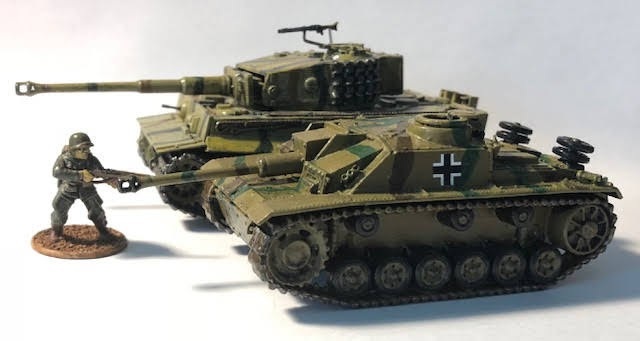 I have thought that about buying from another company so I can compare the quality of other companies to these tanks but with no issue so far I'm sticking with Warlord Games tanks.